Windows Update (a.k.a. Microsoft Update) is normally pretty reliable in terms of keeping your computer up to date and secure. Unfortunately, there are times when an update crashes your PC (usually due to a conflicting OEM driver) or the update process just stops working. Since Windows Vista, Microsoft moved away from using the update.microsoft.com website and now has a dedicated app in the Control Panel. However, the underlying technologies are still the same. Even if you have the Windows Software Update Services (WSUS) server, controlling 100s or 1000s of computers in a corporate network, you are still going to come across the same kind of problems. 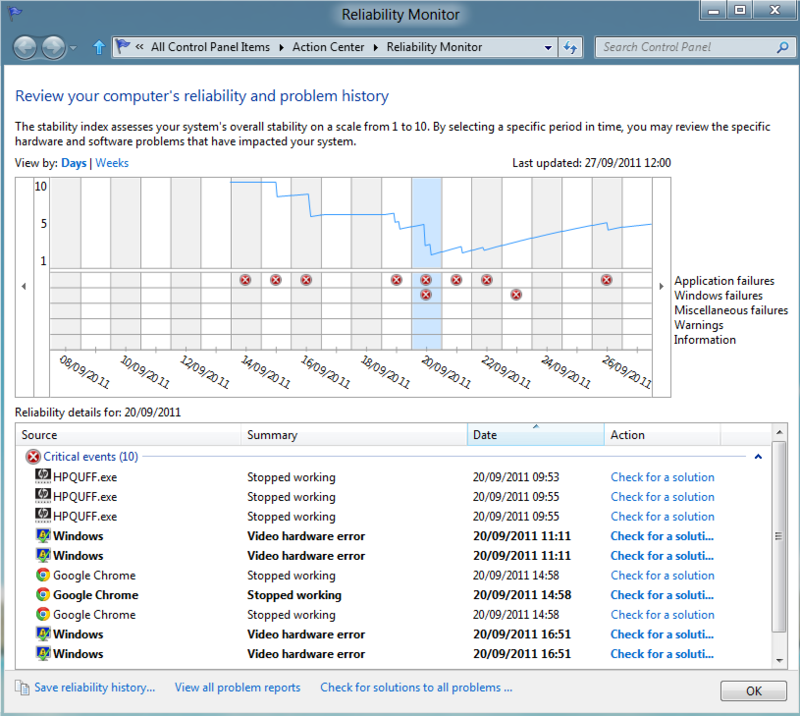 You would hope that WSUS had some easy troubleshooting/rollback tools built in but unfortunately that is not the case. If your PC or Server has started to have problems out of the blue chances are that it could be caused by a recent update. You can see all of your recent updates in 1 of 2 places. 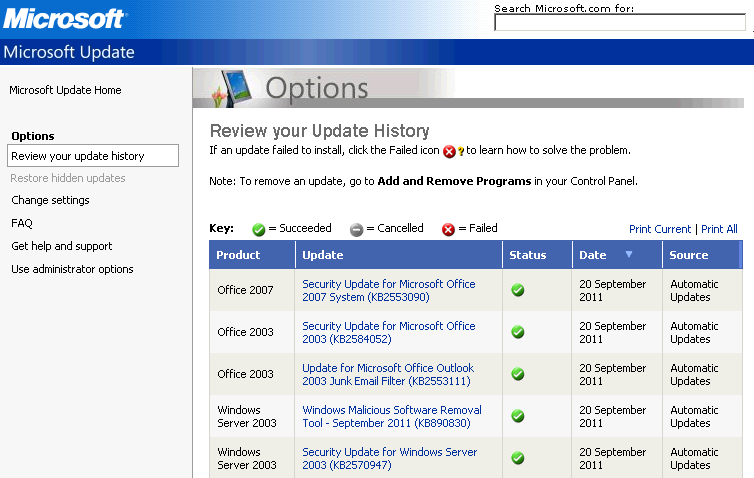 If you have Windows XP, Server 2003 R2 or older you need to go to the Windows Update website and click the link to “Review your update history” (see image). 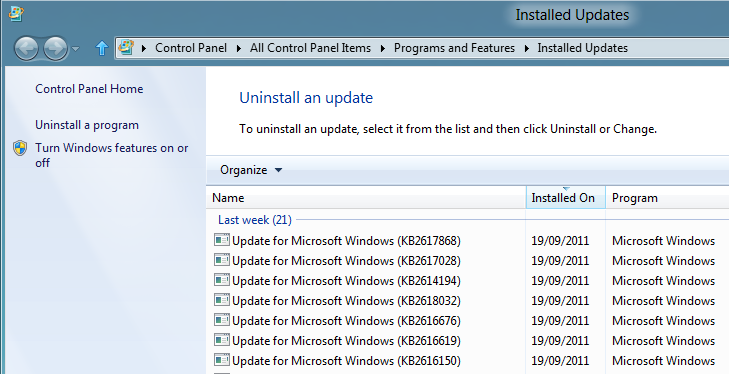 Once you have identified the recent updates you can uninstall them from the Add/Remove Programs app in the Control Panel. If you are using Windows Vista or newer things are a bit easier for you. Just open the Control Panel and search “updates” to find the “Installed Updates” app. From here you can uninstall them directly. All versions of Windows keep logs of any errors to do with software. The place to look for these is in the Event Viewer (Found in Control Panel > Administrative Tools). Look out for events from Windows Update Agent in the System log but also look for errors in the System and Application logs around the same time that updates were applied. If you have a newer version of Windows you can also look at the dedicated WindowsUpdateClient events by expanding the Event Viewer tree to Application and Service Logs > Microsoft > Windows > WindowsUpdateClient > Operational. All of the information relating to updates gets archived in the Windows Update log. This is a text file that can be found in C:\Windows\WindowsUpdate.log. This will show extensive information about every tiny detail regarding the update services, in fact it is rather bewildering. The Microsoft Support site has an article explaining the layout and what all of the abbreviations mean, How to read the Windowsupdate.log file, but even that seems over-complicated. 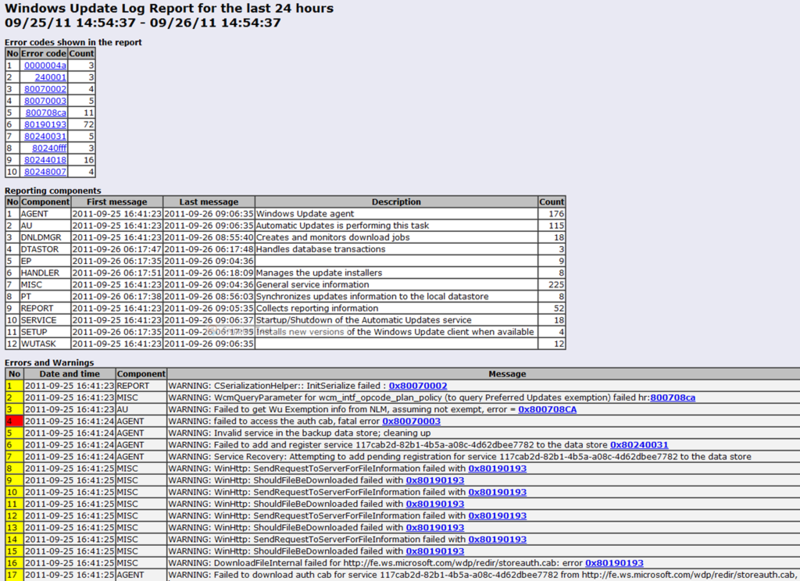 Sometimes, it isn’t worth the hassle of searching through all the logs or fiddling with advanced settings. In fact, this could even make things worse! I often tell home users to always use the built-in Windows System Restore app to revert the computer back to a date when you new everything was working. This has the benefit of keeping any files or photos safe even though you are rolling the computer back. System Restore isn’t available in Windows Server. This is by design because you should have your own backup strategy in place for them. If you’ve never restored a server from a backup then you are running the risk of getting really stuck if a disaster ever strikes. Do yourself a favour and try it on a non-critical server to check it works OK. If you a getting a specific error code, it is always worth searching for that code online, especially on the Microsoft Support website. There may be someone out there who has solved the problem already. If you know the KB number of the offending update (as shown on the “Installed Updates” app or log file) you can read all about it at the Microsoft Security Bulletins site. After reading the information you should be able to make a judgement on how you need to deal with it. I hope that has given you a few pointers on how to deal with Windows Update problems. I’d be keen to hear about any tools or tricks you use that I have missed. Please let me know in the comments section. I also used to re-register all the relevant Windows Update dll files using the following commands as part of the same process. I imagine this is partly what the FixIt app does.